CKWD is responsible for the procurement of civil works and other works of the district. This section contains the role of Gender & Development and its plans to the organization. 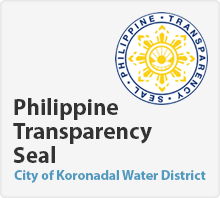 This section contains recent project updates of City of Koronadal Water District. CKWD is committed to serve and maintain quality water supply to its Concessionaires. Check your water rates here..
How do I apply for a New Water Connection and how much will it cost me? Secure Application Form from CKWD office or download Service Application and construction Order. Fill-up and submit form to the office. What are the requirements for a New Water Connection? How long will it take to connect my Water Meter? After approval and payment, releasing of materials and scheduling of installation in next 3-5 days. Do we have extra charges when our meter is being installed? Concessionaire’s plumber shall install In-house / after the meter water pipes. Furthermore, NO CHARGES will be made. Where do we report leakages? How will I address my problems regarding High Water Consumption? Any concerns and inquiries regarding water bills shall be catered by the Public Assistance Customers Desk. What will I do if I need a plumber? If you don’t know any private plumber, you can call CKWD Office and ask for an Accredited Private Plumber. Where can I locate CKWD Office? Where can I pay my water bills?